The air tingled with excitement at the Show and Tell performance on Friday afternoon. The showing focused on a “day in the life” of a YAP student, which gave the audience members a glimpse into the students’ experiences throughout these past three weeks. This performance did not include any of the choreography that was shown in the Festival Finale on Saturday evening, but was breathtaking nevertheless. Musicians Terrence Karn and Rob Flax started the show off with their creative music classes. 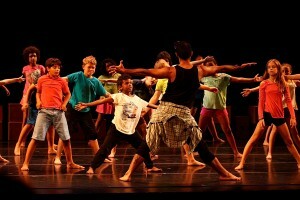 The “tick tocks,” YAP’s youngest students, began by sitting cross-legged on stage following Terrence in a fun body percussion sequence and sang along with Rob. Next, the “middle ages,” showed their new knowledge of time measures through clapping, hitting the stage, and counting along with their teachers. The “senior citizens,” YAP’s oldest students, then performed one of their favorite songs, “Wild Things” by Alessia Cara. The audience watched with huge smiles on their faces as the students gathered in a half circle and sang the lyrics and clapped. Following the music portion, theater teacher and assistant to YAP director, Annalyn Lehnig, led the teens in a theater exercise in which they interpreted one of their peer’s walking patterns. Next, the “tick tocks” ran to the stage to demonstrate their new dancing skills with teachers Patrick Ferreri and Rose Leach. Patrick had the “Yappers” speed up and slow down their movements to add even more creativity to their dancing. Not to be outdone, Patrik then began a warm up with the “middle ages,” complete with yoga poses, planks, and handstands. The show continued with hip-hop and other demonstrations that highlighted the students’ originality and talent. Only a little over 24 hours later, our “Funky Timers” geared up for another beautiful performance. They participated in the Bates Dance Festival Festival Finale that included pieces choreographed by professional artists and performed by students of the Professional Training Program. They had the opportunity to show their families and friends their choreographed music, dance, and theater pieces and also had the chance to watch the older dancers perform. The YAP students’ artwork, which included self-portraits, drawings, and their tree designs, was also displayed beautifully in the Alumni Gym. The YAP Festival Finale began with the students’ voices stating what day and what time they were born. Annalyn and Rob added a soundscape on top of the voices, creating a nostalgic and beautiful beginning. As the “Yappers” sat in a meditative pose, one of the students displayed the quote; “Time is too slow for those who wait…” The “tick tocks” and “middle ages” exited, and the teens performed a stunning dance piece to “From Eden” by Hozier. The “tick tocks” re-entered to the sound of a clock ticking, and followed their intern Jazmine in a song and clapping sequence. Next, the “senior citizens” danced in two diagonal lines along to traditionally soulful music performed by Rob Flax and Jesse Manno. After, the “middle ages” performed their hip-hop piece, complete with partnering, lifts, and lots of fancy footwork. A YAP student crossed the stage with the next line of the quote, “…too long for those who grieve,” while Rob and a student played a violin duet, signaling another section of the performance. The “middle ages” then formed a semi circle around one student, and the teens joined singing “Good Riddance (Time of Your Life)” by Green Day. In an extremely heartwarming moment, the older students exited and the “tick tocks” were revealed holding hands in a circle. They moved from the circle to jam out and show off their new dance skills. Next, the “middle ages” demonstrated their musical talent with a full orchestral performance including a flute and a violin solo. The music demonstration lead into an upbeat, modern dance to a remix of “Time After Time” by Cyndi Lauper, performed by the teens. The next quote “… too short for those who rejoice…” along with another beautiful violin sequence cued the “tick tocks” to begin their original song about time. Their song transitioned into a funky dance with headstands and even splits. The “senior citizens” then really showed their “age” and broke out some fancy dance moves despite their need for canes. The YAP faculty and staff is truly proud of the “Funky Timers,” and their hard work was evident in their beautiful final performance. At the final bow, the audience went absolutely wild. Everyone was clearly very touched by the young artists’ creativity and talent. Bates Dance Festival is thankful to host this exceptional program each year.